Hello Friends, At first welcome to my blog. 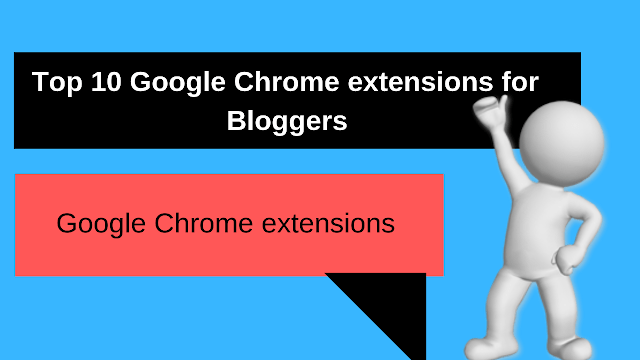 Today In this article I will discuss Top 10 Google Chrome Extensions for Bloggers. Blogging is tough. But it’s incredible if you get all the tricks and techniques. But the new bloggers have a lot of problems. They didn’t know how to manage their blogs properly. So here are some Google Chrome extensions that help you manage your blogs properly. You can only a You can just apply and see the results. Chrome provides a lot of amazing tools and extensions which helps you in your work. If you’re a future professional blogger, you always know one thing without tools or extensions, we can’t manage our blogs properly and we can’t grow quickly. Therefore, tools are the main parts of blogging. Grammarly is the best blogging tools/extensions. We have many grammatical errors when we write a blog post, emails, letters, etc. Grammatically helps you to find errors and correct all of your errors. It is embarrassing to find grammatical errors in the content that you have just released or you just published or the email you just sent. Today’s blogging success means that you have to write the right grammar for quality content. Important content always grows, so you must write good content. Remember that content is king. It’s easy to use. Just subscribe to your Gmail ID. Did you know what Grammarly thinks is, it’s always free. If you pay, you have many characteristics. But I have to say that it is good for new bloggers to use as free. You’ve heard about tools right already? If you’re not, I’ll explain. The buffer is essentially the social media management tools. You can manage all your social media accounts like Facebook, Linkedin, Google+, Twitter, Instagram with just one click. If you didn’t know about buffering and trouble sharing your blog post on the social media platform, you should use these tools. When you install the Buffer extension on your browser, you only have one click to share your post. If you waste time sharing your post with the social media platform, I must recommend using this extension. Keywords Everywhere are the best tools for your blog and youtube research in keywords. It helps you to find many incredible keywords that you use and rank # 1 on Google. Did you know how hard it is for new bloggers to find keywords and rank on google, bing, yahoo? But you can quickly find your ranking keywords using this extension. It shows you volume, CPC and competition keywords. You need to trust this extension to find your golden keywords 100 percent. It also helps you to find keywords for videos on YouTube. There are many tricks and tips for applying for this extension, which will help you find the best keywords. Gmail Sender Icon is the best extension to use Icon to manage your emails. A lot of Icons are available to use your Gmail. If you are a youtube or a blogger, you will receive new emails from your customers every day. Awesome Screen Shot is Screenshot ‘s best chrome extension. It offers tons of options, is easy to use and is completely free of charge. The best thing about this tool is that it offers a number of options when you take ScreenShot. It’s easy to create ScreenShot looking professional. It takes the screenshot hole page, the selected area and the entire screen area visible. It’s the perfect tool to take a screenshot easily and easily. If you’re a blogger, you’ve got to know Silimar Web. It is the best tool to find any website commitment, such as estimated visitor, time on site, page by the view, global rank, bounce rate. You have the idea of any websites using these tools. It shows you all the traffic, sources, geo, reference links, ads only one click on this website. You can install this extension on your Chrome browser and simply type any website URL and see all the details of the website itself. I’m going to make this extension really impressive, did you know why? If you use Google Adsense to fund your blog, you’re going to love this extension. It directly blocks your ads from your websites. It’s the best advertising tools on your own websites. It gets a bird’s eyes overview of your account right from your own websites. It adds overlays to your advertisements to show basic information about the display URL, ad size and advertiser name. See an inappropriate ad and have it blocked from your website? Image search is the best tool for searching web images. According to your research, you can use an extension more or less. Look for Google and find your right pictures that take a lot of time, so this extension helps you find pictures just one click. Once this extension has been activated, you can search for any web Image. You can use Adblock Pro and out of your way get all the ads. I’m sure you’re going to be better able to focus on all the noise gone. Imagine you have to visit 10 search engaged websites. Sufficient to turn off right? But to avoid that, there’s an extension. You can hear about the extension if you are a blogger. It is the best tools to find out how your content works. Use this extension to show how many backlinks and social shares you have in a piece when you click this particular extension on the web page. This extension offers an easy way to see the content engagement that you can also use BuzzSumo to analyze your competitors to uncover strategies that could make your content more shared.